This is an exciting new project growing directly out of our RAP project. “The Saskatoon Restorative Action Program Inc. (RAP) undertakes a number of projects each year to provide leadership opportunities for youth in our RAP schools. This year, RAP has partnered with the Saskatoon Council on Aging (SCOA) to have students teach seniors how to use technology. 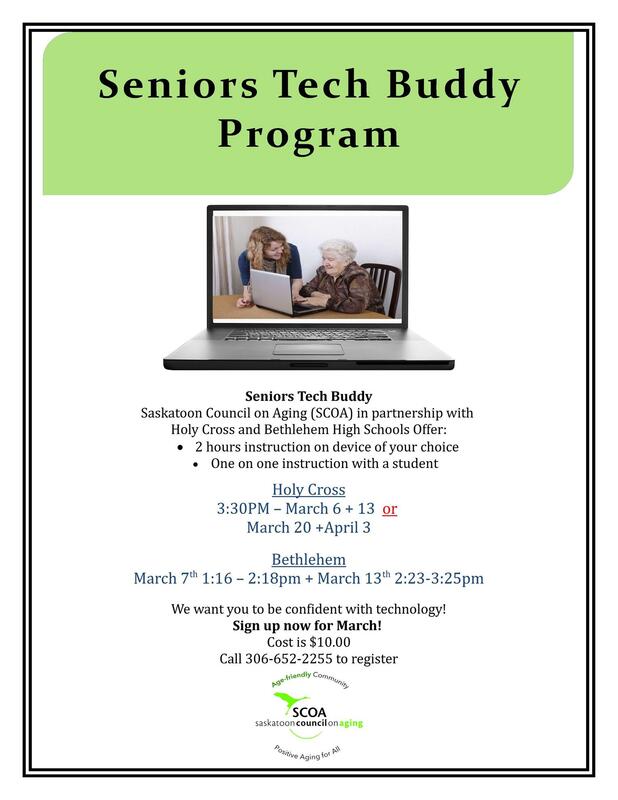 The program is called Seniors Tech Buddy Program. Tech Buddy runs twice per year March/April and October/November. Those who sign up get 2 hours of one on one time with a high school student on whatever device they choose, learning whatever they choose. There is a $10 registration fee, payable when dates are confirmed with the participant. Each registration provides the participant with the two one-hour sessions. The sessions are offered at Holy Cross after school starting at 3:30 pm and at Bethlehem school during the school day, usually between 1 and 3pm. The contact person at SCOA is Sandra Schweder and she is available for inquiries at 306-652- 2255 from 8:30am to noon Monday to Friday. Attached is an electronic copy of a Tech Buddy poster with appointment times listed in the reverse side. RAP is also aware that many Rotarians are interested in learning more about social media. RAP Executive have asked SCOA to set up a special presentation on social media at the SCOA offices located at the Field House. Our target goal is September 2017 for this portion of the program. From these presentations, it is hoped that a better understanding of what training would be of interest regarding social media. From that knowledge further one on one training appointments will be pursued.